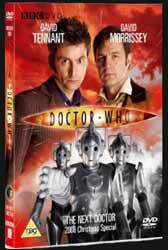 It’s Christmas Eve in 1851, and the stomping footsteps of the Cybermen stalk the snows of Victorian London. When the Doctor arrives and starts to investigate a spate of mysterious deaths, he’s surprised to meet another Doctor. Soon the two of them must combine forces to defeat the ruthless Miss Hartigan, but are even two Doctors enough to stop the rise of the CyberKing...? As we now know, David Morrissey is not the Eleventh Doctor. I’d already guessed as much before I sat down to watch this hour-long special on Christmas Day. I suspected he would turn out to be some kind of fake, though writer Russell T Davies still managed to fool me, as I imagined he was going to be a con artist, like Banto Zame in The One Doctor. Davies keeps the wool over our eyes for just long enough, before revealing the truth about Morrissey’s Doctor about halfway through the show. Morrissey is excellent as the character, who is just the right side of annoying boisterousness to begin with, before developing into a more flawed and vulnerable yet no less heroic figure. The other major guest star is Dervla Kerwan playing the villainous Miss Hartigan. Her performance is arch without ever becoming pantomime. Her delivery of the words “Is it too exciting?” and “Cybermen” is pure trailer material. The Cybermen themselves make a welcome return. Some critics claim that the creatures have been over-used, but this is only their third appearance in the new series, compared with the Daleks’ five stories to date. The notion of the CyberKing is a rather silly one, but it makes for a splendid spectacle. The greatest flaw in Davies’s script is that explanations for what is going on tend to come a little too late - and may sometimes be insufficient for casual viewers who might not remember the events of episodes the Tenth Doctor (David Tennant) gabbles about. Nevertheless, The Next Doctor proves to be one of the strongest Doctor Who Christmas specials yet. Certainly it’s a vast improvement on Voyage of the Damned, and it makes a pleasant change to have a Christmas story that is not set in the present day. On top of that, we have a nice little clip sequence showing the previous nine Doctors. This is the first time we’ve ever seen footage from the old series in the new one, and it’s a neat nod to a similar sequence in the 1982 Cyber-story Earthshock. The DVD also includes Doctor Who at the Proms, an hour-long special comprising edited highlights from the Doctor Who Prom in July 2008, hosted by Freema Agyeman (Martha Jones) with guest appearances by Catherine Tate (Donna Noble) and Julian Bleach (in his guise as Davros). It’s always great to hear tunes such as “Donna’s Theme”, “The Girl in the Fireplace” and “This is Gallifrey”, and it’s an added bonus to see the looks of wonderment and joy on the faces of the children in the audience - and occasion fear, when the monsters get too close! The Prom includes the special mini-episode Music of the Spheres, featuring David Tennant as the Doctor and Jimmy Vee as a Graske. This is far more enjoyable to watch in context, with the audience reactions, than on its own on the internet. With two Doctor Who episodes and two Doctors, The Next Doctor - 2008 Christmas Special is a great present at any time of year.